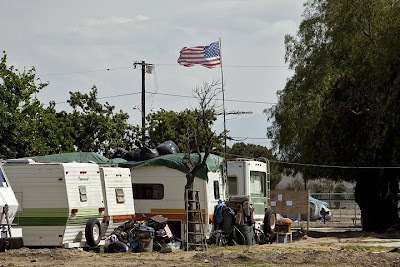 Was on assignment yesterday to shoot the Tent City located in Ontario, CA. 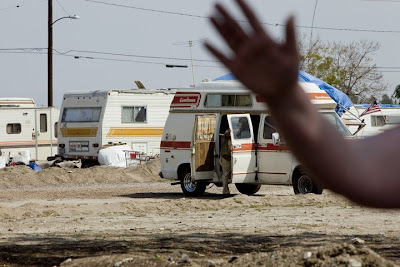 Tent City is a homeless encampment located next to the Ontario Airport. Homeless people from the surrounding areas took over a plantless dirt patch just west of the airport, parked their campers and cars, pitched tents making the patch their new home. 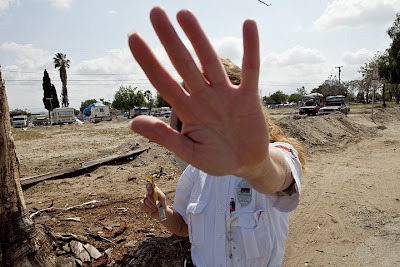 Over the last year, the City of Ontario has evicted many of the homeless residents, and forced the ones left to wear colored wrist band with due dates to vacate the encampment. Tent City is now surrounded by cyclone fencing and port-o-pottys giving the encampment a stark prison like look. The 150 residents that live there now are under constant guard by Securitas security agents, and have to follow strict rules. 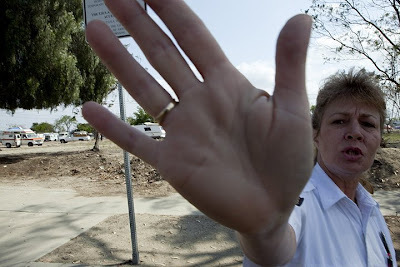 When I tried to photograph Tent City, I was told to leave the area by the Securitas agents. The agents followed me street to street, even pushing my camera into my face at one point. Another person joined in to attempt to stop me from taking photographs, waiving their hands in front of my camera lens as well. They called me every name in the book and threatened to call the police, which they said they did. The police never came. It was a bizzare day, and I was told that they have my license number and are going to come over my home and harass me.